Pub in East Dulwich. 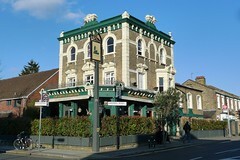 It's part of a small chain that also includes the Aeronaut in Acton and the Old Nun's Head in Nunhead. Kake and friends visited on a Friday lunchtime in September 2015. Arriving at their opening time of noon, we were the first customers, though one other turned up about half an hour later. Music was playing, not too loud. Three of the five handpumps were on, offering Sambrook's Pumphouse, Sambrook's Junction, and Laine's Best. A pint of lime and soda was £1.20. According to their website as of August 2015, sandwiches are served noon-3pm Mon-Fri photo of sandwich menu in Sep 2015; brunch is served 11am-1pm Sat; and the main menu is served noon-3pm and 5pm-10pm Mon-Fri, 11am-10pm Sat, and noon-8pm Sun photo of main menu in Sep 2015, photo of specials board in Sep 2015. Kake tried the feather steak and rice noodle salad (£8.50) photo. It was good, enlivened with lime juice and fresh mint leaves. The vegetables (thinly-sliced radishes, carrots, and mangetout) seemed to have been lightly cooked and were perhaps a little soggy, but this didn't really detract from the dish. The steak was very competently cooked, not at all overdone, and a generous portion. Child-friendliness: They have at least three highchairs. Dishes that can be made in child-sized portions are marked on the menu; on our visit there were two of these, namely a burger and fish & chips. They told us they also have other children's dishes, but we didn't ask for details. Accessibility: A ramp followed by a step to get in. Another step to the toilets. Last visited by Kake and friends, September 2015. Opening hours taken from the Great Exhibition website, August 2015. Last edited 2016-09-18 15:38:11 (version 3; diff). List all versions. Page last edited 2016-09-18 15:38:11 (version 3).